« February is all about HEART! That 9 month young tomato picker sitting in his father’s arm happens to be your Delta Grower; “Born and raised” in the greenhouse as they say. I learned by crawling between the vines and playing with my Tonka Toys in the greenhouse soil, there was no better place in paradise than in those greenhouses. 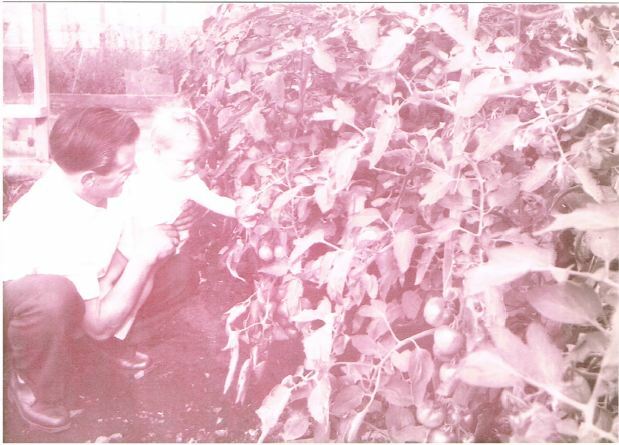 When I started working in my father’s greenhouses in the 80’s, he was already in his 50’s, a tomato-veteran, but still amongst the very best tomato growers of Holland. I couldn’t have asked for a better mentor. From those years on, there was nothing I liked more than growing tomatoes but time did not stand still. We have implemented one improvement after the other as the industry has evolved. It is the everlasting urge to be better with each year and adapting ongoing innovations that makes growing tomatoes an addictive sport. This entry was posted in Greenhouse Grown, Life, Mastery, Newsletter, Sustainability, Tomatoes and tagged Greenhouses, Houweling's, Houweling's Tomato Experts, Houweling's Tomatoes, The Vine. Bookmark the permalink. Comments are closed, but you can leave a trackback: Trackback URL.